Psalm 61:1-4 – Hear my cry, O God, listen to my prayer; 2 from the end of the earth I call to you when my heart is faint. Lead me to the rock that is higher than I, 3 for you have been my refuge, a strong tower against the enemy. 4 Let me dwell in your tent forever! Let me take refuge under the shelter of your wings! 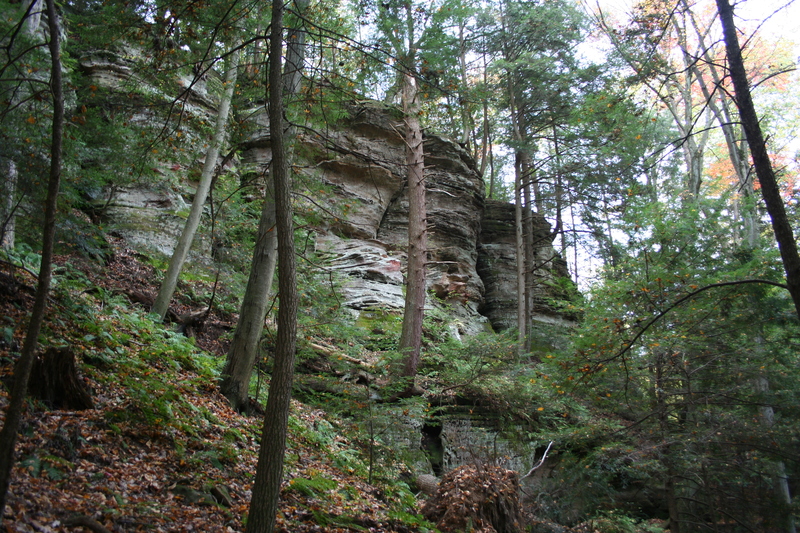 Some of the towering cliffs along the trail in the Cantwell Cliffs area. Hocking Hills State Park, Logan, Ohio. If you have ever hiked in an area with towering cliffs you know just how small and insignificant you feel when you take the time to stop and look above you. The use of rock imagery to describe God is found throughout the Bible, particularly in the Old Testament. For centuries rock was the only available building material strong enough to build fortresses and walls to protect a city from an invading army. And, even though the weapons of modern warfare have made the stone fortress obsolete, many ancient examples still survive demonstrating their permanence, so that this imagery is easily understood even today. Although we can appreciate this imagery, it is still just a literary tool used to describe some of the characteristics of God in terms that we can understand. Fortunately our God is much stronger and more permanent than any rock formation found in nature or stone fortress built by the hands of man. Far better, still, our God is a living God, one to whom we can cry out in our times of need, one to whom we can look for protection when we are under attack from the world, the flesh, or the devil. He is also the God to whom we commit our time, talent, and treasure, the God to whom we offer our devotion, praise, and worship. “Let the words of my mouth and the meditation of my heart be acceptable in your sight, O LORD, my rock and my redeemer” (Psalm 19:14). This entry was posted in God is Revealed... and tagged Cantwell Cliffs, Cliffs, God, Hocking Hills State Park, Logan Ohio, Ohio, Ohio State Parks, Redeemer, Rock, Salvation by Todd D. Nystrom. Bookmark the permalink.